Forecasts have increased in the Bow River basin since the May 1 forecast. 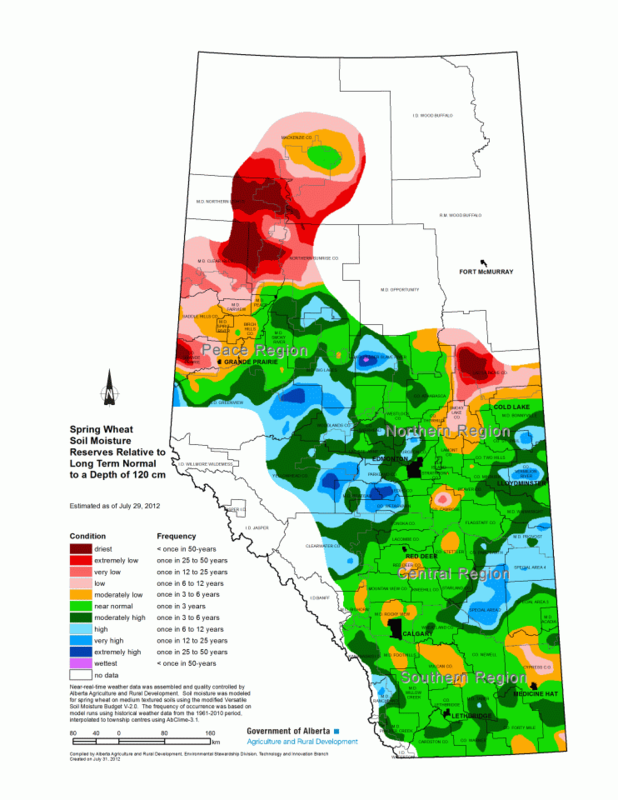 The increase is due to the heavy precipitation that fell in southern Alberta during the months of May and June. Forecasts in the Red Deer, North Saskatchewan and Oldman River basins have not changed significantly. Below average to above average for the Oldman River basin. Below average to much above average for the Bow River Basin and above average for the Elbow and Highwood River basins. Average to above average for the Red Deer River basin. Much above average for the North Saskatchewan River basin. Precipitation can have a major impact on water supply between now and the end of September. The forecasts above assume that precipitation over the remainder of the summer will be normal. The range of possible precipitation scenarios is large however, and as a result, probable range forecasts and a minimal precipitation forecast of natural runoff volume are also provided for each individual basin. Since more information becomes known over time, forecast ranges will narrow over time. Streamflow volume forecasts are updated monthly from February to May, and again in July depending on precipitation and streamflow conditions. Recorded 2012 volumes are preliminary and subject to change. Check our Forecaster's Comments throughout the month for updated information regarding runoff conditions. Alberta Agriculture models soil moisture for non-mountainous, agricultural areas of Alberta. Modelled soil moisture compared to average as of July 29, 2012 is available here. Environment Canada (issued on July 31, 2012): Temperatures are above normal for Alberta from August to October 2012. Precipitation is normal for east central Alberta and below normal for the rest of the province. National Oceanic and Atmospheric Administration (NOAA) (issued on July 19, 2012): An equal chance of below normal, normal, or above normal temperature and precipitation in southern Alberta, from August to October 2012. Climate indicators : The NOAA issued on July 5, 2012: There is an increased chance of El Niño conditions July through September 2012.